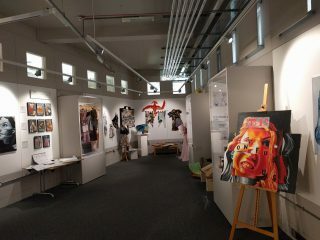 Harborough Museum is part of a cultural hub on the first floor of The Symington Building, Market Harborough. 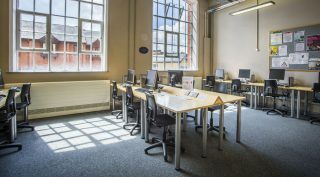 It shares a space with Market Harborough Library, Adult Learning and the Registration Service. There is level access to the main entrance of The Symington Building, where Harborough Museum is based. From here you can access Harborough Museum on the first floor by using the building’s main lift or a platform lift. Users of wheelchairs and mobility scooters are welcome, although Class 3 mobility scooters are not allowed on upper floors. A hearing loop is installed on the first floor of The Symington Building, where Harborough Museum is based. There are no glass doors in Harborough Museum and large windows do not have high-contrast markings. Some areas of Harborough Museum have low-lighting. The Hallaton Treasure Movie does include subtitles. Our address is: Harborough Museum, The Symington Building, Adam and Eve Street, Market Harborough, Leicestershire, LE16 7LT. You can get to Harborough Museum by bus and train. The nearest bus stop is at The Square, which is 0.3 miles / 0.5 km from Harborough Museum. The nearest train station is Market Harborough Station. The train station is 0.6 miles / 1.0 km from Harborough Museum. You can view information about accessible taxis on the Harborough District Council website, at the bottom of the page. To access Harborough Museum please ask to be dropped off at the front entrance on Adam and Eve Street. 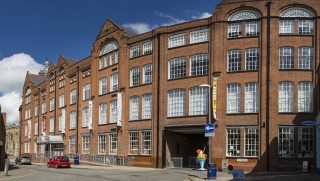 The front of The Symington Building, showing cars in front of the main entrance, and pedestrian access to the Symington Way car park. There are dropped kerbs on Adam and Eve Street outside the main entrance of The Symington Building, if you are being dropped-off. Cars and taxis can drop people off on Adam and Eve Street. There is a car park at the rear of The Symington Building, on Symington Way. 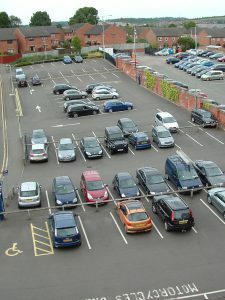 It has 98 pay and display spaces and six disabled spaces. For more information on parking and other nearby car parks, please visit the Harborough District Council website. The surface from the car park to the entrance of the museum is a mix of paved and tarmac surfaces. From the street to the main entrance and from the Symington Way car park, there is level access. The path is wide outside the front entrance and is slightly sloped from the Symington Way car park. The main entrance is accessible from the street via a ramp. Main doors are double-width, sliding and automatic. The ground floor of The Symington Building is level. There is a concierge desk by the main entrance and the floor is a mix of tiles and carpet. 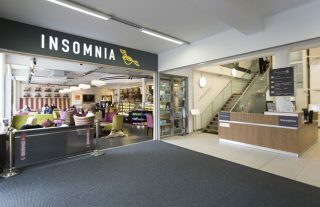 Insomnia cafe and the concierge desk from the main entrance. 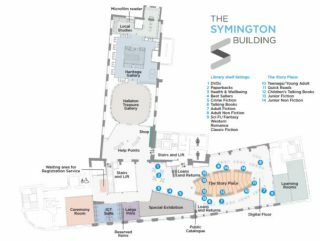 A map of the first floor of the Symington Building. There is a platform lift, suitable for one wheelchair or up to two people. 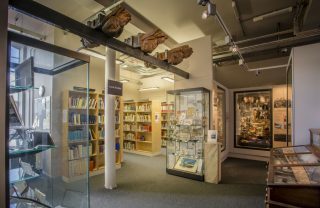 This is by the concierge desk and only goes to the first floor, directly accessing Harborough Museum and Market Harborough Library. 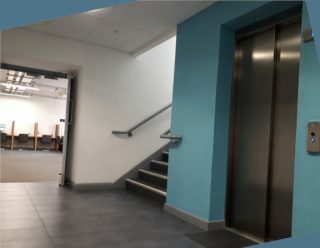 The main lift of the building has level access from the main entrance and goes to all four floors of The Symington Building. The lift door is wide enough to accommodate wheelchairs and Class 2 mobility scooters. Class 3 mobility scooters are not allowed on upper floors of The Symington Building. The lift has floor announcements at each floor, lift buttons have raised numbers or letters and an indicator shows and the floor number. There is a mirror located on the rear of the lift and no music played. The flooring in the lift is marble-effect and can be slippery when wet. The main lift in The Symington Building, leading to all floors. 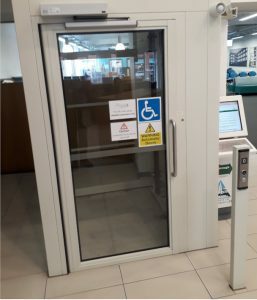 The help desks are located in front of the platform lift or, if using the main lift, can be accessed from the double doors on your right as you exit the lift. All routes to the desks are at least one metre wide. Low counters are available. Help desk 1 viewed form the platform lift. There is a browser area nearby with seating available. The area is well lit by suspended lights. Entry to the museum is free. There is a hearing loop at the help desks and some staff are Dementia Friends. From the help desks to this area, there is level access. Most display information is at low height. There are moveable seats and the floor is carpeted. The Hallaton Treasure movie is played using a screen and speaker and there are two interactive screens, which include subtitles and headphones. Sound from the Hallaton Treasure movie only plays when a button is pressed by visitors. This area has low lighting, stools and chairs which can be used in front of the Hallaton Treasure movie screen and interactive screens. From the help desks to this area, there is level access. Information is displayed at different heights. There is a fixed bench and the floor is carpeted. There are two screens showing historic images of Harborough, which include titles. This area has low lighting and chairs from the Hallaton Treasure gallery can be used. A low bench and low-height children’s activity table, with toys and dressing up clothes is also in this area. 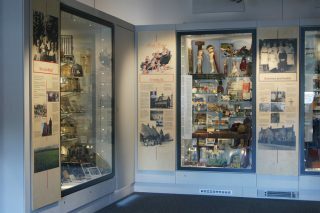 Two cases in the Heritage Gallery. From the help desks to this area, there is level access. There are public-access computers, reference and loan books on full-height shelves and the floor is carpeted. To use the computers and borrow books, you must be a member of Leicestershire Libraries and you can join at the help desks. There are facilities for reading and printing microfilm and microfische. This area is well-lit with suspended lights. From the help desks to this area, there is level access. 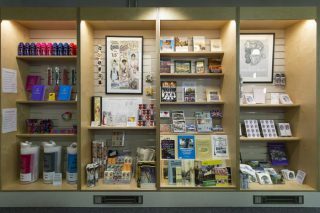 Our own temporary exhibitions include low height information, and we ask community groups to do the same. . This area has low lighting, the floor is carpeted and seating can be requested if needed. From the help desks to this area, there is level access. Most display information is low. There are low-height tables and stools for children, a two-seat sofa and the floor is carpeted. 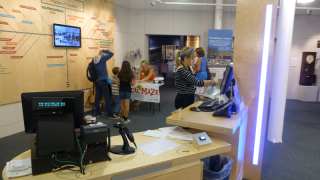 This area contains children’s books, as well as some low-height interactive museum displays. There is an interactive floor, which has changing images and sounds. This area has good lighting. There are chairs around the Story Place. From the help desks to this area, there is level access. Books are presented on full-height book shelves and public-access computers are on normal-height tables. There are seats and the floor is carpeted. To use the computers and borrow books, you must be a member of Leicestershire Libraries and you can join at the help desks. This area has good lighting from suspended lights. There is are accessible toilets on the ground, first and second floors of The Symington Building. From the main entrance and helps desks to the public toilets, there is level access and there are grab rails located by the toilet. The shop is next to the help desks and accessible from the main and platform lifts. The route through the shop is at least 1m wide and the flooring within the shop is carpet. Our staff are available to assist customers who require merchandise from high shelves. There are low counters at the help desks and merchandise is displayed on full-height shelves. A hearing loop system is available at the help points. The shop area by the help desks. Insomnia cafe is located on the ground floor by the main entrance and is operated independently of Harborough Museum. The cafe has level access from the main entrance and features background music. Please contact the cafe for more information and to enquire about dietary requirements by calling 01858 439999. There are many other cafes nearby in Market Harborough, including several on Adam and Eve Street. For information about other cafes and places to eat, please visit Explore Harborough. 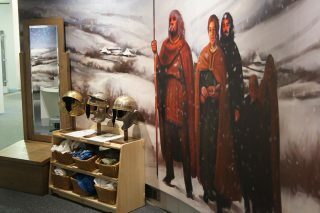 We have a hearing loop in all public areas of Harborough Museum and we welcome visitors with assistance dogs. We have emergency evacuation procedures for disabled visitors. In the case of an evacuation, all customers inside Harborough Museum will be led to safety by a member of staff or by a member of the Fire and Rescue Service. There are also refuge points.